Pu-erh tea (Pu-erh) is the tea world’s answer to fine wine. The class of tea known today as Pu-erh tea – known in earlier times as black tea based on its deep, dark color; however, black tea is a completely different class of tea, and the name was changed along the way – is tea that is allowed to ferment and age. Like fine wine, Pu-erh can be aged anywhere from several months to many years and just gets better with time. A highly-regarded, even prized, tea from China, tea connoisseurs there have stocks of Pu-erh that date way back, some to 100 years. Pu-erh goes through an “auto-oxidation” process where it is exposed to micro-flora, oxygen, and humidity. Flavors and aromas of the tea are richly altered, the results of which people either love, or hate. Pu-erh is the only class of tea that is fermented, or aged. Some people confuse fermentation with oxidation, but they are completely different things; near opposites, in fact. Fermentation by its nature is an oxygen-deprived process. Oxidation, which occurs significantly in black tea, is an oxygen-rich process. 1. Sheng Pu-erh (aka Green Pu-erh) – made from the raw, non-oxidized tea leaf, as in green tea. This is the traditional Pu-erh. Mao Cha Sheng Pu-erh (aka Young Green) – this style is made for future consumption, compressed, and properly stored and aged. 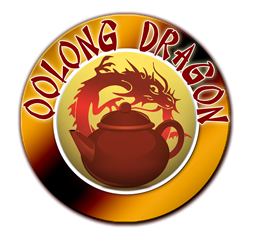 Dry Storage Pu-erh/Naturally Aged – this is a great style for both immediate consumption and prolonged storage and is shaped and compressed into cakes (called beeng cha or tou cha), bricks, or other artistic designs. 2. Shou Pu-erh (aka Black Pu-erh) – made from the oxidized tea leaf, as in black tea. Wo Dui Shou Pu-erh translates to “wet-pile fermented” – typically ready for consumption, a loose-leaf style, but sometimes pressed into interesting shapes. Wet Storage, quick aging – Pu-erh purists don’t think much of this style because of its forced aging. The tea is typically compressed into a beeng cha and can be of many layers. Both the Green and the Black Pu-erh start out as leaves from an ancient variety of the Camellia Sinensis tea plant called Yunnan Big Leaf or Dayeh. These old plants produce large, hearty leaves, perfect for Pu-erh. The Dayeh plant rests from plucking only to produce new leaves and is plucked continually throughout the year, contrasting with leaves from bushes used in other classes of tea, which are only seasonally picked. These old bushes are more like tree and grow scattered widely across the countryside, making gathering their leaves a time consuming process with transporting challenges. Once the Dayeh leaves are picked, they are given an initial sorting and left to dry in the sun for a short period. The leaves are then given a firing to remove the excess moisture found in larger leaves. The amount of time that the leaves are allowed in the firing is a critical step, as the remaining water content will be different depending upon the type of Pu-erh the tea makers intend to make Black or Green. If a Sheng Pu-erh will be made, the firing will be thorough enough to completely deter any enzymatic processes and oxidation from occurring, but stopping short of eliminating all of the moisture in the leaf. Some moisture is required for fermentation to occur. Once the tea master has determined that enough moisture has been driven off and that the leaf is stabilized so as not to incur oxidation, the leaves are laid out (typically on the floor) where they are allowed, under close supervision, to ferment. During fermentation, the tea leaves are regularly turned to ensure evenness in fermentation. By turning the leaves, each leaf has a chance to be at the core of the pile, which being underneath top layers of leaf is deprived of oxygen, is filled with natural heat, and is where fermentation thrives in the form of microbial activity. Upon completion of this initial fermentation, the Mao Cha is compressed and packed into desired forms, wrapped and labels, stored under controlled air conditions, and left to go through a slow and natural post-fermentation process over the following ten years. After about six of those years, the Mao Cha’s balance of moisture and bacteria begins to slow the post-fermentation process. It is at this point, and from here on out, that the Pu-erh becomes a dry storage/naturally-aged Sheng Pu-erh, and is ready for tasting. 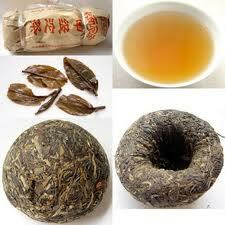 However, raw Pu-erh can continue aging for over 50 years without diminished quality. In the 1970’s, the demand for Pu-erh prompted some enterprising tea makers to come up with an accelerated aging process that would put Pu-erh on the market more quickly. The result was Shou Pu-erh tea. Up until the leaves are piled on the fermenting floor, Shou-Pu-erh undergoes the same processing as Sheng Pu-erh, although the amount of moisture retained in the leaf from the initial firing is far higher to allow for additional oxidation. The moist leaf is piled on the floor in a denser fashion that what is done when making Shou Pu-erh. The heat and humidity are controlled to encourage a quick fermentation of the leaves. The leaf pile could remain this way for up to 70 days or more. During this time, the leaves are stirred, rewet and replied, as needed. This process allows quality boosting microbes to thrive, and the tea leaves undergo a process akin to composting. When the tea master has determined that the tea has become Pu-erh, the leaves are treated as an oxidized tea would be, with final firing that expels excess moisture and stabilizes the tea. The finished leaves are either then left loose and are ready to pack up or consume as Wo Dui Shou or they are pressed into discs and sent to wet-storage. To create a wet-storage/quick aging style of Pu-erh, after the leaves are pressed into discs they are stored in a room that has humidity set above 80%, and they are occasionally rewet. This allows for quick-aging Pu-erh, but tea connoisseurs will tell you that the results are far inferior to Sheng Pu-erh. 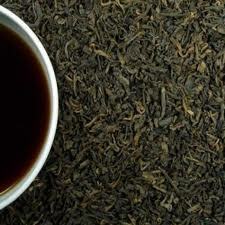 Black Pu-erh can continue aging up to 15 years without diminished quality. Pu-erh qualities will vary based on the number of years aged and whether it is a Green Pu-erh or a quickly-aged Black Pu-erh. Pu-erh is desired for its strong, aromatic characteristics. The body of Pu-erh is described as full, brisk, bright, earthy, exotic, pungent, strong, woody, and heavy. In terms of flavor it is described as nutty, smooth, sweet, musty, short-finished, lingering finish, and herbaceous. It is said that you will either love or hate the Pu-erh liquor. It seems a drink destined for adventurous tea drinkers and tea connoisseurs, but if you are not either of one those but enjoy tea, curiosity alone might just lead you to that first sip. Traditional White Tea – Delicate, Expensive, and Mimicked Yellow Tea is Lush, Elusive and Totally Smothered!